IMVU is the #1 3D avatar-based social experience with the largest 3D world and catalog to customize your look and meet new people. You can chat with friends, roleplay and join a virtual world with millions of others. The best part? It’s totally free! Enter a virtual world simulator and social chat. IMVU is more than a life simulation - it’s a virtual life in a 3D world with an avatar that you make. Choose your life as you want it to be. Customize a 3D avatar, personalize your own animated emoji and message friends! Does life have you down? Then your dream life, love life and virtual life await in IMVU! YOUR VIRTUAL LIFE The avatar life is your life, make it what you want it to be! Want a love story? 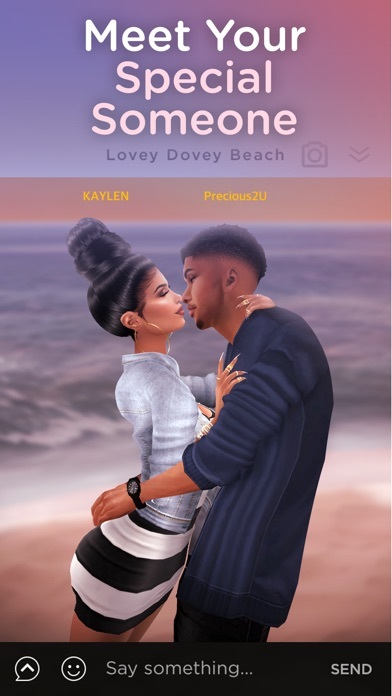 IMVU can be a dating simulator for your avatar’s love life. Want to explore? A whole virtual reality awaits. AVATAR CREATION – MAKE YOUR NEW SELF Choose your life and customize yourself. With our 3D avatar creator, you can design yourself from top to bottom. Shop without limits and dress up you avatar to suit your style! EXPRESS YOURSELF AS YOURSELF – ANIMATED WITHMOJI Chat with friends using your personal animated WithMoji. Enjoy the online social game with your friends, and role play your virtual life however you desire - get weird, get wild, it’s all you! CHAT IN 3D – VIRTUAL CONVERSATIONS Chat with friends from all over the world! In our chat lobby, you can meet new people near and far. The 3D Avatar chat gives you full conversations that are more than instant messages. GET SOCIAL AND SHARE YOUR #MOOD Show how you feel while you chat. Change your poses, add filters and post photos to get people talking. The virtual chat gives you a range of emotes, emoji and functions, bringing life to your 3D avatar. Role play and chat with friends to create an amazing story – it’s your world and your choices. 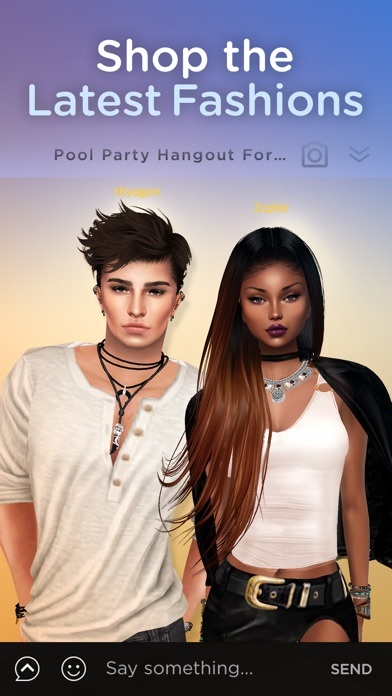 Your virtual world, virtual reality and virtual life await in the IMVU free app - join today and make your avatar! BECOME A LIVE ROOM HOST You will need a Host Subscription subscription to become a Host of a Live Room. As a host, you have access to brand new perks! Have your own public room that gets featured to millions of users. If you want to have a larger party, you can turn on Audience Mode and host thousands of users in your room at the same time. Want even more perks? You will also get the Host badge and free Credits every month with your subscription. • Payment will be charged to your iTunes account at confirmation of purchase. • Your subscription will automatically renew each month 24 hours before the end of the current period. • Your credit card will be charged through your iTunes account unless auto-renew is turned off at least 24 hours before the end of the current period. • You can turn off auto-renew at any time from your iTunes account settings after purchase. • Any unused portion of a free trial period, if offered, will be forfeited when the user purchases a subscription to that publication Renewal prices are as follows: • Monthly Subscription of 1 Live Room Token, Host Badge, and 2,000 Credits for $4.99 • Monthly Subscription of 2 Live Room Tokens, Host Badge, and 2,600 Credits for $7.99 • Monthly Subscription of 3 Live Room Tokens, Host Badge, and 3,600 Credits for $9.99 For 3D avatar chat rooms on older devices, please follow the steps below. Please keep in mind that your experience may not be optimal. • Tap the main navigator in the top left corner • Tap Graphics Options • Tap “Full 3D” Then enter your favorite chat room and experience 3D! 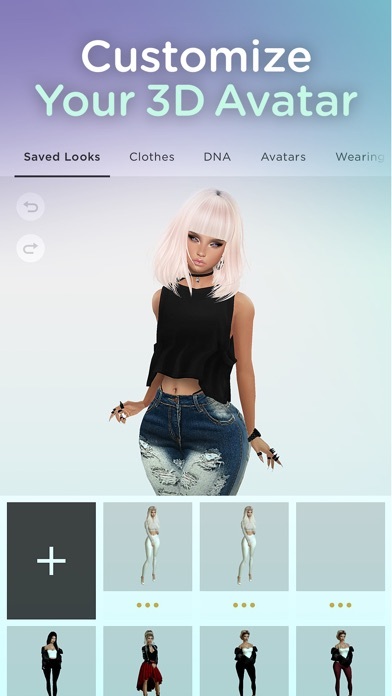 Imvu is such a great app, but can you make the update that when you go on someone’s profile, somewhere it says what their wearing, I REALLY want this to happen in the game there’s this girl, and I really want the same shirt as her and I can NEVER find it! IMVU, please see this and make the update, it would mean a lot to me also, I’ve been stuck for the same clothing for 2 months, so how this works, people have the exact amount of credits to get the clothing they like. But than start from 0 credits again? I think that’s a little sad. Can you please fix this and give us 2,000 credits a month? I love imvu I have been playing it for about 2 years now and I have noticed good and bad things. First when you join you get 4,000 credits to start your account. I think they should give you more credits because 4,000 isn’t a lot to buy all the things you would like. Also I don’t think you should be allowed to buy credits. This is because kids are spending way to much money on this game. I love Imvu, but these issues I’m having could be a game changer. For the past 3 days I’ve been trying to log in my account and on the first try it’s says “ Too many attempts “. I’m trying to get help but in order for me to get help I have to be logged in...yea that makes a lot of sense 🙄..yes that was sarcasm..
It’s awesome but it keep showing to many attempts like why tho?